The Q8 headlights include the benefits of HD matrix LED headlights fitted as standard, not only featuring the dynamic turn signal front and rear, but also an impressive light show during locking and unlocking. 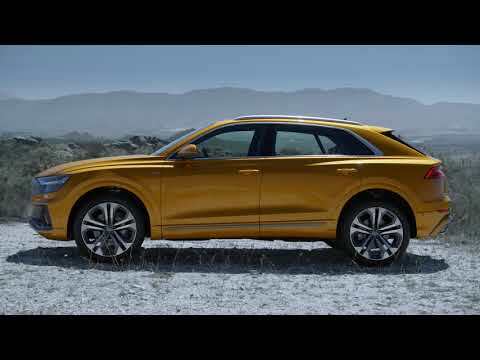 Future integration with the myAudi app allows the Q8 to activate various lighting functions all from a smartphone, to experience outside the vehicle - a unique feature for the Q8 in the competitive field. Each headlight unit consists of 24 individual LEDs and, from afar, the two-part lights appear flat, with only the top section visible. They integrate the daytime running light and the low beam, among other functions. The high beam is positioned underneath, darkened and offset to the back. Audi is quattro and quattro is Audi – this of course applies in particular to the Q8, our range topping SUV.The purely mechanical centre differential transfers the forces to the front axle and rear axle at a ratio of 40:60 as standard. The suspension makes a crucial contribution to the precise handling. The five-link front and rear suspensions are made largely of aluminium, delivering a precise and accurate drive. The upper MMI touch response display is the central element of the interior of the Audi Q8. With its black-panel look, it almost dissolves into a large, black surface when switched off. Simple, easy-to-understand symbols stand for the digital precision and for the high level of integration of the architecture and operation – simplicity replaces complexity. Meet the new Q8 Coming Soon!